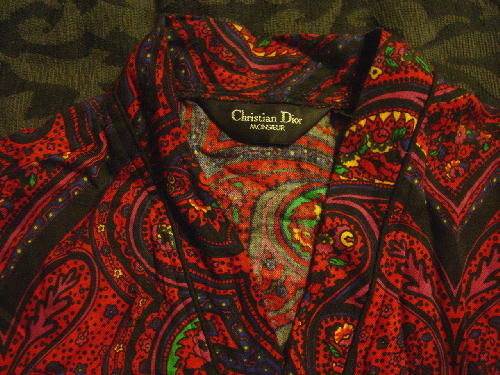 This 100% rayon soft robe is a vintage Christian Dior Monsieur and was made in Hong Kong. 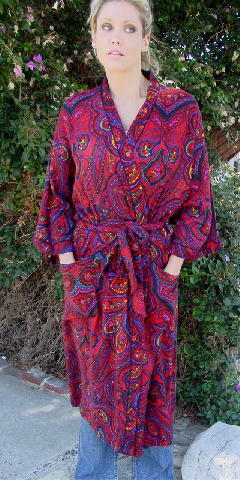 It has 3/4 length sleeves and a fabric matching double sided belt. 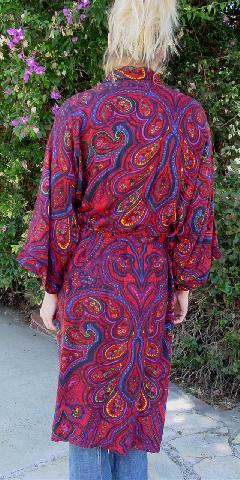 There is a red background with a paisley design in yellow, green, hot pink, and black. It has two belt loops (one above the other) on each side. It's from a former Hollywood actor. shoulder to shoulder 23 1/2"
shoulder to end of sleeve 13 1/2"
shoulder to hem 45 1/2"
belt 7 1/2" by 2 1/8"